Politico created a handy infographic showing which states have already taken advantage of the Wayfair decision to start making remote sellers charge sales tax. Taking advantage is the right term to use, because many states have been fretting over how much potential revenue they've lost. They know their residents are sending money out of state and ignoring their use tax obligations. When it comes to sales tax, state legislators start talking about how many billions of dollars they've lost out on. Reason magazine points out that those legislators feel a lot better about collecting those billions from people who won't be voting either for or against them. When they finish talking about the mighty streams of revenue they guess they'll be getting, they remember to mention the Main Street Mom and Pop businesses which will now get a level playing field. Not in New Hampshire. 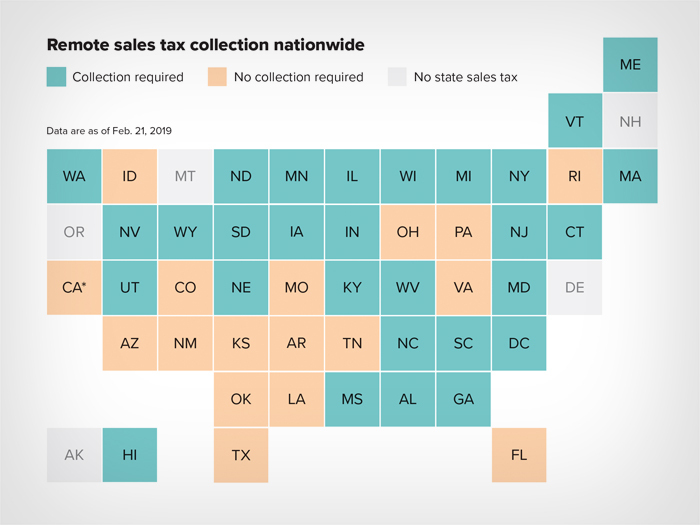 New Hampshire doesn't collect sales tax at all. The overturn of Quill makes New Hampshire legislators think about two things. First, they figure they lose out on the advantage of not collecting sales tax. People in neighboring states will drive to New Hampshire to shop just for the sense of freedom it gives them. Second, they see their constituents at a disadvantage. They're not used to collecting or remitting sales tax. They don't know how to do it and they don't have the needed software. Senator Jon Tester joined with co-sponsors from Oregon as well as New Hampshire (neither state has sales tax) to introduce the Stop Taxing Our Potential Act of 2019. It's substantially the same as the STOP Act of 2018. It "prohibits a state from imposing on a person obligations related to collecting or paying a sales tax, use tax, or similar tax unless the person had a physical presence in the state during the calendar quarter with respect to which the obligation is imposed." There's no cookie nexus or click nexus here. The bill is very specific about what "physical presence" means. It includes things like having a physical office with three or more employees, or "maintaining a commercial or legal domicile in the state." It specifically disqualifies things like affiliate marketing, internet advertising, temporary presence like a trade show, drop shipment or other kinds of delivery and set up activities, and several more of the tricky things that have turned up in courtrooms across the nation. Why is New Hampshire hot under the collar? This isn't stopping with a bill in Congress. The state has a website set up to collect stories from businesses being pestered by other states to register and remit sales tax. “We don’t recognize the rights of these jurisdictions to impose these taxes on our businesses,” Rep. Jess Edwards told Bloomberg. Not collecting sales tax is part of the New Hampshire "Live Free or Die" identity. Businesses are uncomfortable collecting sales tax -- and many don't have enough experience to figure out how to fit it into their business systems. On the other hand, New Hampshire isn't offering to go to court for businesses facing a sales and use tax audit from another state. They tried to formulate a law that would force other states to register their intention to compel New Hampshire businesses to collect sales tax, and to prove that they had a constitutional right to do so. The law didn't stand. Plenty of Granite State businesses are sitting back and doing nothing about sales tax in other states. That's not a good idea. Sales tax has to be collected from consumers and passed on to the state. Businesses have to register with states where they have nexus before they can collect those taxes. But a failure to collect the tax doesn't mean you don't have to remit the tax. An audit can leave you with a bill you have to pay -- even if you live in New Hampshire. Sales Tax DataLINK can make sales tax compliance easy. Our sales tax solutions calculate, validate, report, and file with just a few clicks. What's more, we offer sales tax services that take the whole thing out of your hands. Unlike many solutions, we're not focused just on retail. Construction, manufacturing, mining -- our expert team knows the ins and outs of sales and use tax in your industry, and in the jurisdictions where you might have exposure. Call for immediate answers to your sales tax concerns.